For many liberals, the question "Do others live rightly?" feels inappropriate. Liberalism seems to demand a follow-up question: "Who am I to judge?" Peaceful coexistence, in this view, is predicated on restraint from morally evaluating our peers. But Rahel Jaeggi sees the situation differently. Criticizing is not only valid but also useful, she argues. Moral judgment is no error; the error lies in how we go about judging. One way to judge is external, based on universal standards derived from ideas about God or human nature. The other is internal, relying on standards peculiar to a given society. Both approaches have serious flaws and detractors. In Critique of Forms of Life, Jaeggi offers a third way, which she calls "immanent" critique. 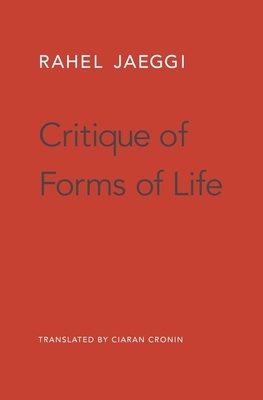 Inspired by Hegelian social philosophy and engaged with Anglo-American theorists such as John Dewey, Michael Walzer, and Alasdair MacIntyre, immanent critique begins with the recognition that ways of life are inherently normative because they assert their own goodness and rightness. They also have a consistent purpose: to solve basic social problems and advance social goods, most of which are common across cultures. Jaeggi argues that we can judge the validity of a society's moral claims by evaluating how well the society adapts to crisis--whether it is able to overcome contradictions that arise from within and continue to fulfill its purpose. Jaeggi enlivens her ideas through concrete, contemporary examples. Against both relativistic and absolutist accounts, she shows that rational social critique is possible.